When creating my list of books to read in 2014, I thought, I should be able to do this. I was determined to read more from this year’s list than I did in 2013. After all, there were quite a few books that I was excited to read; I was motivated. I did well at first, even reporting my numbers a few short weeks ago. Then it happened. My husband, eldest niece, and I went to see Divergent, all having read and loved the series. And we got more than we bargained for while there: we were introduced to a book we hadn’t heard of, soon to be released in movie form, The Maze Runner . I couldn’t help myself; I started researching it while still sitting in the theatre. Who was the author? When was it published? Is there more than one book? Why hadn’t I heard of it? 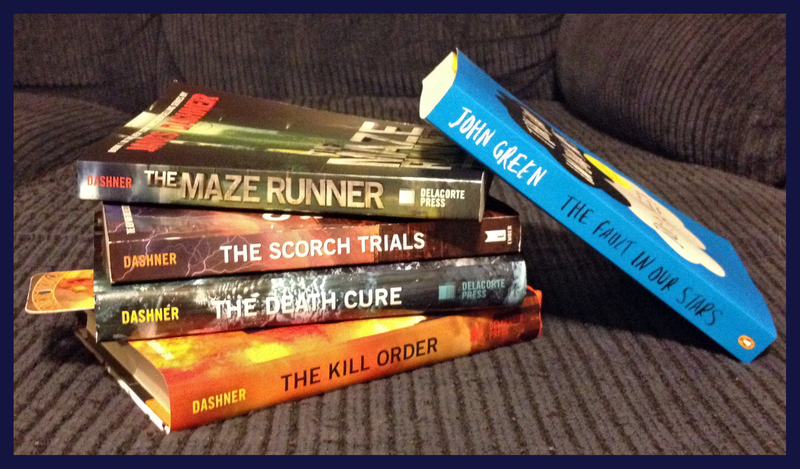 James Dashner, 2009, two sequels and one prequel – these were the easy answers. As for why I hadn’t heard of it, well, there are just so many books out there. Each new discovery adds another star or constellation to my reader’s night sky, and the funny thing is that I am never satisfied. Give me a good book, and it only makes me want more. A few weeks later, when my husband asked what I wanted for my birthday, I got the bright idea that I could kill two birds if he got The Maze Runner for me. Since I knew he wanted to read it, too, he went ahead and bought it a few days early. I was dutifully reading another book from my list with the full knowledge that I would completely derail if Thomas said the book was any good. Thomas pronounced The Maze Runner worthy, so I took the cash a few relatives gave me for my birthday and went to pick up the rest of the series. The cashier told me that if I didn’t care about them being a matched set, I could buy all three from the bargain section. Which saved me enough money to buy a fourth book, John Green’s The Fault in Our Stars . 1. You always have a book in the car, just in case you get stuck in traffic. No, I don’t read or text while driving, but I do when stopped at a light. Hey, I have a very stop-and-go commute, and I get tired of listening to the radio. And if I’m not the driver, you better believe I have a book with me. I feel bad for people who get carsick – such a great reading opportunity missed. 2. You panic when you forget your book. It’s one thing if you’re just going to the store, but it’s full-scale panic mode when you are stuck at a social event with nothing to do except make small-talk with people you hardly know. Or even people you do know. It’s kind of a joke among my family that I’m often in the background of photos, oblivious to my surroundings, absorbed in a book. Everyone’s opening Christmas presents, and I’m reading. Or I sneak a book into a movie to read before the lights go down. 3. You can never read all the books on your to-do list because you keep adding more. When I was pregnant with my first son, I was determined to read every book in the house. I figured that I might never have the chance to read after my little bundle of joy came into the world. I’m happy to report that not only did I finish all the books in the house, but reading does continue post-baby. And ever since making that discovery, I’ve been buying more books than I can read again. 4. You spend your disposable income on purses big enough to hold a good-sized hardback. 5. You forego putting your china out in favor of shelving your books in the china cabinet. Or on top of the piano. Or in stacks around the house. I’m doing a pretty good job of keeping them neat (at least, I did until my latest quadruple purchase). But although I’ve dreamed of having a house with a proper library, I somehow think it still wouldn’t be enough. Give me shelves, and I will gladly fill them, then continue getting more. You know, if this is a vice, I’m not sure I want to give it up. Please tell me I’m not alone. If this sounds like you, too, do we need an intervention, or just some uninterrupted reading time? Methinks the latter. This entry was posted in About the Writer Mom, Odds and Ends and tagged Book List, Books, Divergent, James Dashner, John Green, Reading, The Fault in Our Stars, The Maze Runner. Uninterrupted reading time, definitely. I agree with almost everything you said, but I am one of those unfortunate people who can’t read in a moving car without getting carsick. That’s when I do my daydreaming. I do the same thing! I will get a book list put together but as soon as I find one I love I have to find out about the author and then read everything they have published, I’m doing it right now with Gillian Flynn. Thank you! Glad I’m not the only one. I wish to share my reading options to you.My kindle has WARLOCK of Wilber Smith for office break. Car has A Sigma force novel “Map of Bones” of James Rollins.In home I am reading “Pride and Prejudice” for 5th time. Thanks! I’ll look them up.